Thousands Of Motorists Stranded By Snow In French Alps : The Two-Way People have been unable to move for two days due to heavy snow and ice on the road to and from major ski resorts in the Savoie region. 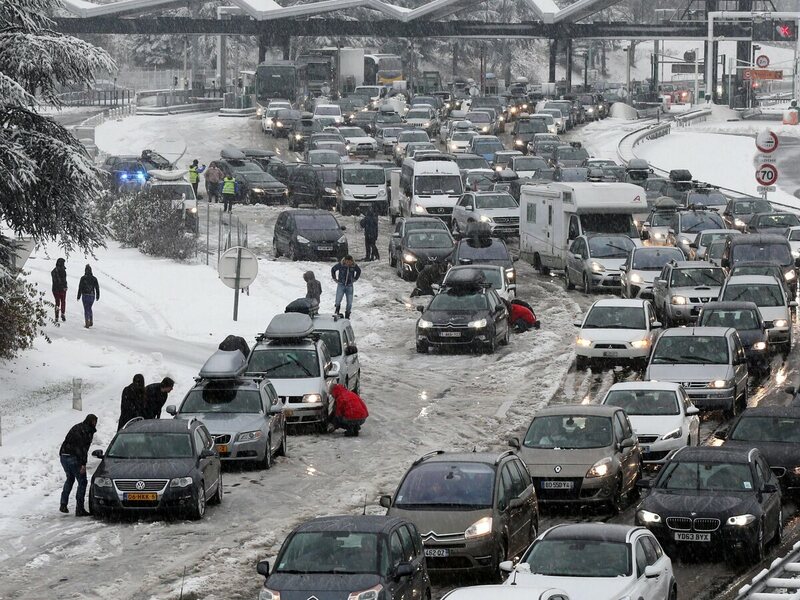 Drivers park to put on snow chains in the middle of a massive traffic jam in the Savoie region of France. Thousands of motorists are stranded for a second day. Thousands of vehicles are stranded in the French Alps unable to come or go from ski resorts in southeastern France due to particularly heavy snowfall and icy conditions. One man was reportedly killed when his car slid off into a ravine. The BBC reports that as many as 15,000 motorists who spent Saturday night unable to move due to the snow and ice, are still unable to move in the region of Savoie, west of Turin, Italy. Officials set up emergency shelters in at least 12 towns, France 24 says. "Conditions improved on Sunday, with French forecasters lifting an orange weather alert - France's second highest - of ice and snow, according to French media reports. "The French government had earlier urged drivers to "exercise the utmost caution" and avoid travel if possible."